Derek Silveira (L) defeated Roberto Valenzuela, Jr. to re-capture the N.E. title. HAMPTON, N.H. (April 13, 2019) - Popular Derek "The Surgeon" Silveira operated last night on previously undefeated Roberto "El Viejo, Jr." Valenzuela, Jr., re-capturing the New England welterweight title, by way of an eight-round unanimous decision in the main event on the "Riot at the Rim" card, presented by Granite Chin Promotions (GCP), at The Rim in Hampton, New Hampshire. 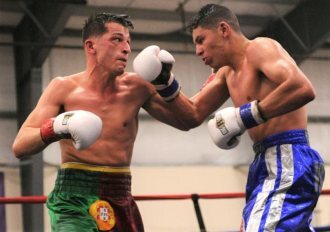 Silveira (16-2, 8 KOs), fighting out of Salem, MA, rocked his 19-year-old Mexican challenger, Valenzuela (14-1, 13 KOs), whose father and cousin also fought on the card, in the first round with a right that dropped his tall, lean opponent. In fact, Silveira stopped Valenzuela's father two years ago via a second-round stoppage. Silveira originally won the N.E. welterweight title in 2011, holding it for two years, but he never lost the strap in the ring. He was inactive for nearly 3 ½ years and relinquished his title because of inactivity. "I never really lost the belt," Silveira said after the fight. "I got back what I was supposed to have. This kid hit hard. One of the reasons for this (performance) is that I stayed in shape and had a real training camp instead of training only after work (carpenter). I thought it showed in the ring tonight. "From watching video of him, I was looking for his right. My coach said to slip it and come back with a right, and I hit him right on the button. But he hit me with some good shots, too, and I was a little gassed in the last two rounds." "He was injured," Silverira added, "and I respect that. I was excited to be in a title fight with two local guys. I'd definitely like to fight Demko." New England cruiserweight champion Chris Traietti (27-4, 21 KOs), who is the GCP promoter, was supposed to fight Gilberto "El Magico" Matheus Domingos for the vacant World Boxing Council (WBC), but the Brazilian was unable to enter the U.S. to fight due to visa issues. "I was disappointed with Gilberto's visa situation, but there was no time to let it get me down," Traitti remarked. "As the promoter, I had to focus on the rest of the card, and it turned out to be awesome. I had every intention of this being the biggest Granite Chin Promotions show and it exceeded my expectations. Hopefully this was the start of our next chapter, upping my game, and I plan to promote two more shows this summer." In the most competitive fight of the night, French junior welterweight Romain Tomas (8-2, 2 KOs) pulled off a mild upset in the co-featured event, winning a six-round split decision over previously unbeaten Omar "The Beast" Bordoy (7-1, 2 KOs), fighting out of Danbury, CT.
Lynn, MA welterweight Khiry "TNT" Todd (8-1, 6 KOs) rebounded from his lone pro loss, destroying Mexican challenger Francisco "El Mono" Medal (13-17, 8 KOs), dropping him three times for a statement-like first-round technical knockout. WBC Latino cruiserweight champion Vinnie "American Nightmare" Carita (20-1-1, 19 KOs), of Pembroke, MA, added another title belt to his display case, stopping Brazilian Claudio "Quexada" Porto (8-5-1, 7 KOs) with a devastating left hook to the liver, resulting in a first-round knockout for the vacant ABF Continental Americas Championship. Highly-regarded featherweight Tramaine "The Mighty Midget" Williams, a 10-trime national amateur champion from New Haven, CT, remained undefeated and continued his journey towards a world title shot. Williams (17-0, 6 KOs), who was ranked as high at No. 3 in the world before an inactive period, displayed his vast skills during a workmanlike effort en route to an eight-round unanimous decision victory over his veteran Mexican foe, Ernesto "Monito" Guerrero (30-27, 20 KOs). Williams is promoted by Roc Nation Spots. "Handsome" Henry Gedney (3-0, 2 KOs), fighting out of Gloucester, MA, battered the body of veteran Mexican super middleweight Roberto "El Viejo" Valenzuela (67-79-2, 56 KOs) at the beginning of the opening bell and he continued peppering his opponent upstairs and downstairs throughout their fight. Gedney, a 2017 Rocky Marciano Tournament novice champion, won by way of a fourth-round technical knockout, when referee Leo Gerstel halted the one-sided fight. Undefeated Providence prospect Anthony "Ai" Marsella, Jr. (12-0, 6 KOs), the reigning IBA Americas welterweight champion, dropped his Mexican opponent, Engleberto "Guarura" Valenzuala (11-16, 3 KOs) early in the first round, then a little later he caught Valenzuela with a powerful left to the body for a knockout. Marsella is promoted by Mayweather Promotions. Brooklyn junior welterweight Sidney "Keelo" Maccow (6-8, 3 KOs) pitched a shutout against Andy Aiello (1-3-1), winning all six rounds on the three judges' scorecards for a six-round unanimous decision. New Britain, CT featherweight prospect Nathan Martinez (3-0, 1 KO), the 2017 New England Golden Gloves Most Outstanding Boxer, out-classed North Carolina featherweight Chantae "Malik" Bowens (0-2) for an impressive first-round knockout. Martinez trapped Bowens in the red corner and unleashed six rapid-fire punches to close the show.